This word is coined from the use of a griddle. Griddling is also known in some quarters as char grilling. One way to 'griddle' is by using a ridged pan on high heat over a gas or electric burner. The food is cooked by conduction. All griddle foods have to be flipped to cook on the 'flip' side. This is a great way of preparing foods fast with less oil than frying, making it a healthier way of cooking indoors. 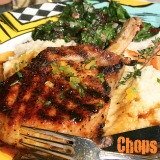 As meats are seared, flavor is locked in while excess fat is extracted for less fatty food. The open griddle pan indoor grilling method works well with thin cuts of meat like steaks, chops, seafood, fish, chicken and turkey fillets. Thick steaks can also be seared on a griddle, crosshatched and then finished off in the oven. Place a heavy, cast iron grill press on meats to help with grill marks and cooking. A set of clean bricks, well wrapped in foil will work just as well to press down on food. Let marinated foods to drain off well before griddling. You will have less steam, smoke and easier clean-up. Use your griddle hot to avoid food from sticking. This is how to tell if the griddle is hot and ready; a drop of water should vigorously bounce around and fizzle into vapor in 2-3 seconds. Always lightly brush your food with cooking oil before cooking to further reduce the sticking. 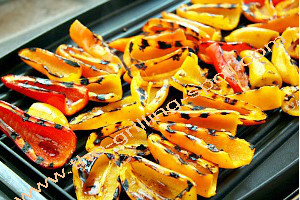 Vegetables can be griddled too. 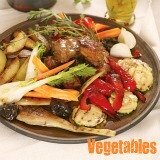 Thick slices of onions, peppers, tomatoes, eggplants and zucchini can also be prepared in this way. 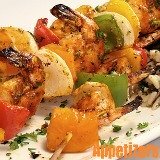 Try dessert items like cheese and slices of pineapple and even breaded recipes like Bruschetta on your griddle. Get a griddle pan that has deep ridges and grooves to give your food nice crosshatches or grill marks. The high ridges will raise your food so that it does not sit in dripping fat. If you get a cast iron griddle, you will have better heat conduction, distribution and retention. Avoid turning food too early. It may stick. Refrain from using metal utensils for turning food if your griddle has a non-stick surface. Always let griddle meat to rest for approximately 5 minutes after cooking, tented or wrapped in foil for the juices to redistribute. Your non-stick griddle pan has a life span. All non-stick surfaces will eventually wear off. You can stretch your pan's life by taking good care of it. All non-stick pans are not made the same. It matters what you buy, how you use, clean and care for it. Some are dish-washer safe, others are not. Some can be used with a wide range of heat sources while others cannot be used on cooktops, stoves or ranges that have induction cooking surfaces. Know your pan. 2. Most non-stick pans can scratch easily. Avoid using metal spatulas and cookware when cooking on or serving from a non-stick pan. Use heat-resistant silicone, rubber or good old wooden utensils instead. 3. Always allow your pan to cool down before you start cleaning. Cooling a hot pan with water subjects it to warping. A warped pan will not cook evenly. 4. Never use abrasive sponges or chemical compounds to clean your non-stick pan. A little warm and soapy water is sufficient. If residue tends to stick, let the soapy water sit in the pan for a little while to loosen it. Use a soft sponge and dish soap to clean your non-stick pan. 5. Allow it to dry first, then apply a thin coat of cooking oil. Wipe it down a little with a moist cloth and store. 6. Do not bundle or stack your non-stick pans with other metalic utensils that may render it susceptible to scratches. Find a way to nest or cover the sensitive surfaces. 7. Avoid using a dishwasher to clean the pan. Dishwasher detergents can ruin the pan. Always handwash and allow to dry well. Handwash even the pans that are said to be 'Dishwasher-Safe', that will help to stretch its life. Cast-iron pans are more rigid and do not require so intimate the care that the non-stick counterpans, I mean counterparts will need. Here are some leading US brand names for the non-sticks :- EarthPan, ScanPan, Swiss Diamond and Starfrit. Other contenders include Berndes, Calphalon, Circulon, Cuisinart, Emerilware and T-Fal. Shopping for A Griddle Pan? 1. 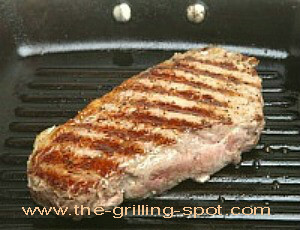 Look for deep ridges to separate your food from the fat and get some killer grill marks or crosshatches on your food. 2. Check the metal to see that you get a heavy or thick gauge metal. A cast iron griddle is best. Many griddle pans give good non-stick capability but the light gauge metal will not conduct and retain heat effeciently and it could burn your food. A thin pan is also susceptible to early warping, due to high heat. One simple way of telling the quality of a griddle is simply its weight. The heavier the pan, the more the heat conduction and retention. 3. Look for a griddle pan with a lid, even if it a tempered glass lid. The lid helps trap heat, moisture and limits splatter. 4. Does it have a rack? A rack helps to keep food items above the hot pan as it stays warm in the covered griddle. 5. Look for one with a good handle. Is it sturdy, comfortable? How will it handle high temperature from the pan? No pun intended. Pun, pan. Handle, handle. 6. If it is made of aluminum and it has a hard anodized non-stick coating, it is not dishwasher-safe and neither can it be used on induction cooktops or ranges. Do you have any questions, comments, observations? Contact us and let us know. We will be happy to hear from you. Have fun griddling, a healthy and economical way to prepare delicious meals indoors!